Giving you the guts and teaching you the tools to launch and improve your own podcast! Enjoy the blog and podcast? Subscribe here! 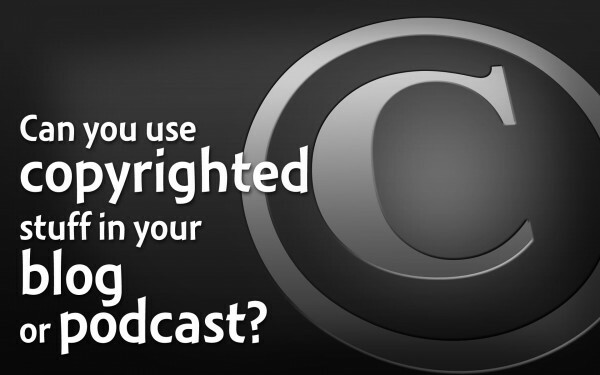 Can you use copyrighted material in your personal podcast? What about “fair use”? And more copyright questions answered by entertainment lawyer Gordon Firemark. Exclusive rights for the own of works of authorship to control how it can be used. Any fixed, original work can be copyrighted (audio, video, code, writing, etc.). Infringement—using copyrighted material without prior permission from the copyright-holder. Derivative—repurposing material or making a new work from the original work. Attribution—giving credit to the author. Public domain—a work that is no longer under copyright law (typically anything older than 100 years and published in the USA). Distribution—any method of sharing something: podcast, email newsletter, blog post, etc. Can you use copyrighted material? Nanny Jenny from the Nanny Cast asked about “performing” copyrighted works by reading them in her podcast. Get permission! Any reproduction or performance of a copyrighted work without permission, is infringement. Anything in public domain (like classic fairytales) is free for anyone to use. If you're denied permission or you don't get it, then you have to look at how much you can use. 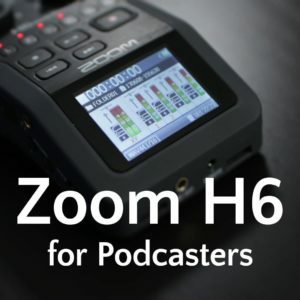 Some will say that podcasts are small enough media that it won't deter sales, but this should be used as support for asking permission, not for using without permission. Whether a sound clip, image, video, quotation, or other excerpt, you may be allowed to include it under the “fair use” clause in copyright law. It can be complicated to determine what is “fair use.” It depends four things: context (nature of the use), nature of original, effect of the market, amount/substantiality of original. Using up to a 60-second clip from a two-hour movie is such a small portion that it's fine for commentary. Referring to copyrighted content is fine in all cases. “Fair use” applies when you are directly reproducing a portion of the copyrighted work. There aren't any hard guidelines for limits. It's a matter of how what is a “substantial amount” for your situation. Sometimes, you can create derivatives (or mashups) with copyrighted material, but it's still best to get permission. Using a theme song from a show as our own theme is copyright infringement, unless you have permission from the copyright-holder. Using a Once Upon a Time podcast as an example, we discuss that using content for segment bumpers without direct commentary is probably “fair use,” but it's very close to on the line. Creative Commons provides easy terms to explain the conditions by which you are sharing your content. Finding content licensed under Creative Commons is easy and clear how you can use the material. Some material will say it's licensed for only personal, but where is the line for commercial? If you use the material for promoting or producing a product, it's definitely commercial. But often, just having ads or affiliate links will push the podcast or blog from personal to commercial, because they are earning money from their content. If you have ads, treat yourself as being commercial. Should we copyright our own content? You should be aware of how to protect your own original work. As soon as your creativity is put in a fixed form (like recorded or written), it is copyrighted. But registering your copyright is inexpensive (around $40) and provides easy protections, even financially. Trying to protect your work without having it previously registered will cost a lot, unless you win. Register your copyrights every few months, as you're allowed to register within three months. You can group material together into a folio of works, like blog posts or podcast episodes. Creative Commons doesn't provide this legal protection that registration does. 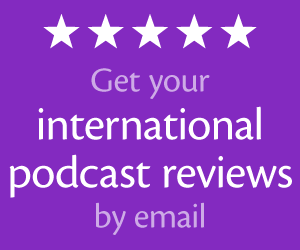 And it doesn't hurt to include a brief mention at the end of your podcast. Get permissions in writing! Email does qualify most of the time. But signed paper is best. Podcasting poll: have you registered a copyright or trademark? I'm speaking in the Podcasting 101 track at BlogWorld NYC! Please join me at BlogWorld in New York City on June 5–7. I'll be one of the panelists in the Podcasting 101 track and presenting on the last day of the conference. Register for BlogWorld NYC for the early discount! Use promo code “PodLewis10” to save 10% off your admission. How's that for a guilt trip? I've started a personal blog at DanielJLewis.net, sharing thoughts and reviews on technology, social media, web design, freelancing, productivity, personal updates, and everything else I want to talk about that doesn't fit in my many other websites. Use the social buttons or retweet the following. I no longer offer one-on-one consulting outside of Podcasters' Society, but request a consultant here and I'll connect you with someone I trust to help you launch or improve your podcast. Subscribe to The Audacity to Podcast on Apple Podcasts or on Android. This post may contain links to products or services with which I have an affiliate relationship and may receive compensation from your actions through such links. However, I don't let that corrupt my perspective and I don't recommend only affiliates. Thanks so much for sharing this valuable information! Last month I gave a presentation at the SXSWedu conference and was unprepared for questions about copyright. Now, as I continue to give more presentations, I will direct them to your site here and accompanying podcast! I’m a little foggy on the fair-use policy. If I was to use one or two relatively short sound bites from separate movies in my intro, so they’d be played every episode, obviously, would this be considered fair use? I use a different clip everyday for my show intro, usually less than 60 seconds, is that considered fair use? I have question about copyright laws and fair use pertaining to karaoke songs. If I were to have a podcast in which someone sang a song as part of karaoke, or even if it were just played in the background, whose consent would I need to release that? Is it different if the show is played on the radio? So, a screenshot from an episode of something to be put in a review blog falls under fair use, right? Thanks for the great article! So, if I wanted to include a few clips of a celebrity saying things, would that be fair use? Like if I had a clip of Bob Barker randomly saying, “Come on down!” and a few things like that, is that okay? From what I understand, it would be okay to use if you were actually commenting on it or making it part of a transformative work, but would become infringement if you made it part of a bumper or introduction that you used all the time. I have a question, is literary analysis, or interpretation considered fair use? I think it falls under the commentary part? I saw that fair use could concern, research, education, journalism, criticism, commentary, but I did not see analysis , interpretation. Like if you talk about a movie you like and you explained the purpose of the director and you explain the symbolism. How it serves the purpose of the work, and so on,giving your own interpretations, my teachers do that a lot in class. Great sounds like it is okay to use a music clip of 10 seconds and talk about the artist on the podcast. 20 things you should do before every podcast episode! As an award-winning podcaster, Daniel J. Lewis gives you the guts and teaches you the tools to launch and improve your own podcasts for sharing your passions and finding success. 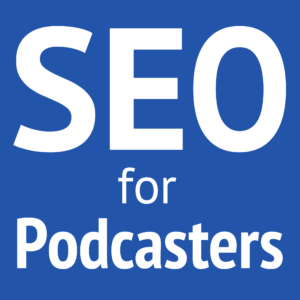 Daniel creates resources for podcasters, such as the SEO for Podcasters training, the My Podcast Reviews global-review aggregator, and the Podcasters' Society membership for podcasters. As a recognized authority and influencer in the podcasting industry, Daniel speaks on podcasting and hosts his own podcasts covering how to podcast, clean-comedy, and the #1 unofficial podcast for ABC's hit drama Once Upon a Time, all under the umbrella of Noodle Mix Network and having received nearly 20 award nominations. Daniel and his wife, Jenny, live near Cincinnati with their newborn son, "Noodle Baby." The Audacity to Podcast and Noodle.mx Network are trademarks of D.Joseph Design LLC™. Unless otherwise indicated, all images, content, designs, and recordings © 2010–2015 D.Joseph Design LLC. All rights reserved. This website contains links and references to products and services that may include affiliates, sponsorships, or other business relationships in which The Audacity to Podcast and D.Joseph Design LLC may receive compensation from referrals or sales actions.